Villa Verao Sol has a great central location and a large private pool. It is just 5 minutes' walk from Praia D'Oura's beautiful golden beach and endless choice of bars, restaurants, shops and nightlife along the lively Strip. What's more neighbouring Albufeira, with a host of amenities, is 5 minutes' drive away. 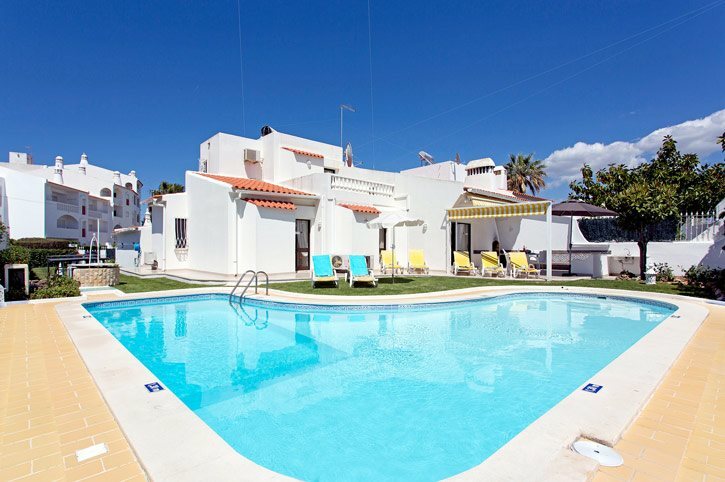 Pool heating, WiFi and air conditioning/heating in the lounge and bedrooms are included in this 3 bedroom villa. The fabulous central location with all you need for a lively holiday practically on your doorstep. A large private pool too! The large private pool takes centre stage with plenty of space around it for relaxing on one of the sun loungers in between taking a dip to cool off. There's a covered poolside terrace, where you'll find a built-in seating area, a table and chairs and brick BBQ - ideal for alfresco dining. There is on street parking for your hire cars. At the front of the villa there is a small gate with a path leading to the front door. On the right a lawn stretches to the rear of the villa and the private pool. patio doors opening on to the garden, pool terrace and covered BBQ area. The fully equipped kitchen with all you need for preparing your holiday food is adjacent. On the ground floor there are 2 twin bedrooms, one of which has an en suite bathroom. They both have patio doors opening onto the pool terrace. There is a separate bathroom. Upstairs is 1 double bedroom with an en suite bathroom and access to a small terrace which overlooks the pool and garden area and has partial sea views. This villa has applied for a licence and the submission number is 2011/343. The licence number will follow. This semi-detached villa is in a residential cul-de-sac within 5 minutes' walk of the beach, a mini market, local restaurants and nightlife along the famous Praia D'Oura Strip. This resort is perfect for anyone wanting lots to do and a lively atmosphere. What's more popular Albufeira with plenty of shops and restaurants along the cobbled streets is just 5 minutes' drive away. Our Villa Pina is located on the same road. There are many shops in Praia D'Oura itself within walking distance from Villa Verao Sol. Alternatively, the older part of Albufeira is ideal to get a taste of the past with its narrow streets and handcraft shops. There are wide shopping streets and a lively atmosphere, particularly in the large square, where live music features at times. Alternatively, there is a local market every Tuesday between Praia D'Oura and the old town of Albufeira. The Strip has everything you need, with all manner of cafes, bars, restaurants and clubs to choose from. During the day, you can enjoy lunch at one of the cafes or restaurants, and at night Praia D'Oura really comes to life with many of the bars and clubs offering a great atmosphere. They are open until the early hours in high season with a varied choice of live music. For something more traditional, in the old town of Albufeira there's a good choice of bars and restaurants to suit all tastes spread all along the narrow, cobbled streets. Praia D'Oura Beach at the bottom of the hill is less than 5 minutes' walk away offering water sport facilities plus a choice of beachside cafes and restaurants. Alternatively, visit the beautiful and expansive sandy beach in Albufeira, flanked by dramatic cliffs and rock formations, a short drive away. For more relaxing surroundings, a string of picturesque cove beaches can be found just to the west of Albufeira, including Coelho, Castelo and Gale. A little further afield, 15 minutes' drive on either side of Albufeira, are the sandy stretches of Praia Grande to the west and Falesia to the east. There's a choice of water-parks and the Zoomarine aquarium and dolphin show within a short drive. Or, for the more active try Parque Aventura in Santa Eulalia, Albufeira, consisting of a paintball centre and various adventure courses through the trees made up of zip wires, bridges and ropes. The International Sand Sculpture Festival, held in Pera, takes place every year from May to October. It celebrates a different theme each year and takes the 50 international artists 8 weeks to prepare for! The exhibits are fantastic and created by artists from all over the world. Alternatively, chic Vilamoura with its international marina, casino, shops and restaurants is well worth a visit for a day or evening out. For golfers, the 9-hole Balaia Golf Course and 9-hole Sheraton Pine Cliffs Course at Olhos D'Agua are nearby, with 6 full, championship courses at Vilamoura to choose from. Villa Verao Sol is not available to book for season as it is sold out. Take a look here at the Algarve villas that are currently on sale. Albufeira is one of the largest resorts in The Algarve and this holiday resort is the original tourist capital of the region. Although the main square is surrounded by souvenir shops and supermarkets, the atmosphere of Albufeira is essentially Moorish with hundreds of white villas streaming out from the centre and hugging the nearby hillsides. During the 19th Century the economy of Portugal was not surprisingly based around the fishing industry. Albufeira was one of the first tourist areas of The Algarve, and in the 1960’,s started to become extremely important to the local economy. Holiday villas have since spread out from the old town centre of Albufeira, to the neighbouring resorts such as Praia d’,Oura. Visit Albufeira’,s colourful marina which is West of Albufeira –, a great place to have a leisurely coffee or a glass of wine whilst watching the boats. A lot of money has been invested in Albufeira Marina with sculptures, shops, the yachting club, watersports and boat trips available. The beautiful bay at Albufeira forms a natural amphitheatre, sheltered by bizarrely shaped cliffs. This is a lively area for a villa holiday, which has a number of bars and nightclubs yet still remains home to some of the traditional Portuguese way of life with local fisherman and their brightly painted boats still plying a profitable trade. We found the holiday and villa to be of excellent standard. The villa had everything you could wish to have, a home from home. The pool was absolutely fantastic and exceptionally clean. We would and have recommended Villa Plus to family and friends and would certainly book again. It took a while to pick a villa that was ideal for both couples but the information on your website was so accurate that we couldn't have found a better place. We found that booking everything through Villa Plus that it all ran smoothly especially the transfers, nothing was too much trouble and we had an exceptional holiday. The local restaurants were fanastic, we never had a bad meal. Any problem we had was sorted by a phone call straight away. All employees of Villa Plus both representatives and cleaners were very helpful. Thank you for such a wonderful holiday and hope to see you next year. The villa was excellently placed in terms of location. It was well equipped, user friendly and had all of the home comforts you would expect, particularly wifi. It would have been better for us to have had 2 double rooms rather than twin rooms, with a villa of this size. The maid service was good. An enjoyable holiday had by all of us, 4 adults and one child. Lovely Villa, Great Location, Fantastic Pool. Would stay again!!! The Villa was in an excellent location, with a few minutes walk to a small beach, which was ideal for young children. five minutes walk to strip. Living and bedrooms were perfect for our group of 4 adults and three children. The pool itself was an ideal size. Excellent all round. Very good location something for all age groups at close hand .